FloodSax®, pronounced ‘Floodsacks’, are the innovative instant sandless sand bag is set to revolutionise the way you control damage due to flooding, storms and accidental water spillages. The semi-porous inner liner contains hundreds of super absorbent crystals which absorb water to 90% capacity in just 3 minutes. Once the water is in there, it stays there and the bags act just like traditional sand bags to keep flood water at bay. FloodSax® are clean, compact and lightweight so they can be stored in every home and business ready to be used at a moments notice. FloodSax® enable virtually anyone including the elderly to defend themselves and react immediately to flooding and accidental water damage using these self inflating sand bags. FloodSax® patented technology and super lightweight design enables them to be stored onsite ready to be used at a moments notice. FloodSax® are not heavy or dirty like traditional sand bags which means they can be used indoors and outdoors. FloodSax® are biodegradable and 100% environmentally safe. We all know traditional sandbags are labour intensive requiring more manpower to handle and deploy but not with FloodSax®. FloodSax® are totally self-contained so there is no sand or bags to fill and the fact they are compact and lightweight means you can distribute thousands more FloodSax® than traditional sand bags with fewer people more effectively. 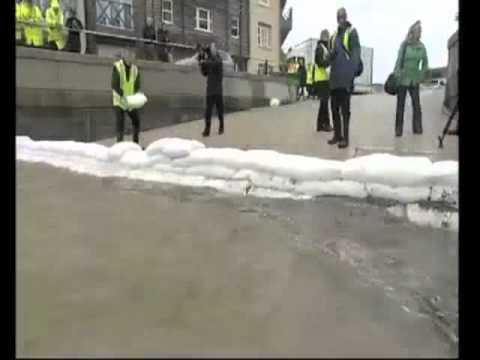 There is no denying that even with pre-made sandbags, the time and effort involved reacting to a flood is made a whole lot easier (and faster! )with FloodSax®. Over the last 24 months there have been many instances of intense rainfall damaging homes, businesses and public assets. Having an easy to use flood mitigation device on hand ready to use at moments notice has minimised water damage in many instances. Take your FloodSax instant sandbag out of the bag and place in position, energise the bag using water from a hose, bucket, sink or the flood water itself and within minutes you are ready to protect your home or business.